Students (19 and over) must be full-time at an accredited Canadian College or University. Proof of full-time enrollment (for at least 3 courses) in both the fall and winter semesters must be presented at the time of pick-up. Showing your Student ID Card is not enough. A complete course listing from the Registrar's Office will be required. Families pay discounted family rates for the 4 oldest family members, and subsequent members are just $25. Family rate eligibility is based on 3 or more members defined as at least one parent and children (between the ages of infant to 18 years) living at the same residence. Revelstoke Mountain Resort reserves the right to determine final decisions on all family season pass applications. Only available for purchase until October 1, 2018. Only 1 parent can use the Pass at any given time. The second parent may access lower mountain for free when the first parent is using the Pass. A lift ticket must be purchased for access to the rest of the mountain when not in possession of the Pass. A lift ticket must be purchased for access when not in possession of the Pass. Maximum age of the child is 5 years (based on the date of purchase). The child's birth certificate is required at time of pick-up. The child's last name must be registered under the father or mother's last name, otherwise proof of legal guardianship is required. RMR Season Passholders benefit from 50% off lift tickets at all Mountain Collective destinations, including Alta, Snowbird, Aspen Snowmass, Big Sky Resort, Jackson Hole, Mammoth, Lake Louise, Sunshine Village, Squaw Valley / Alpine Meadows, Snowbasin, Sugarbush, Sun Valley, Taos, Thredbo and Coronet Peak / The Remarkables. Save on high performance ski and snowboard rentals at the rental department. Save on tuning up your gear for winter and keep it in great condition all season at the repair shop. Save on major brands and regular priced purchases big and small at R Gear and Critical Parts. Hardgoods and softgoods available. Excludes Arc'teryx. Save on select Snow School Programs, all winter long! Lunch, breakfast, and dinner; all available on-resort with a discount for season pass holders. Discount cannot be combined with any other discounts or specials. Offer not valid on the summer buffet breakfast at the Revelation Lodge. Take advantage of reciprocal discounts at partner ski resorts in Alberta and British Columbia. Both resorts must be in operation. Offers subject to change. * Blackout periods apply. Please call to confirm if a discount is available during your visit. To purchase your Season Pass in person, please visit Guest Services in the resort village. Under no circumstances will a refund or credit be given to pass holders that do not purchase the refund option. Refund Option must be purchased concurrently with the Season Pass at a cost of $25/person or $75/family. If a parent, spouse, or child (under the age of 19) is also a refundable pass holder and chooses to cease participation due to a family member's injury or sickness, he or she is also eligible to a refund. The associated family member must be a pass holder at Revelstoke Mountain Resort. The refund is limited to one additional claimant. Debilitating injury/illness that prevents participation in skiing or snowboarding for at least 30 consecutive days . A doctor's note is required. Pass holder's employer requires a residential relocation of at least 300km from Revelstoke. The transfer must take place at least 45 days after the pass purchase date and must be involuntary. Intentional self-injury or pre-existing injury. Voluntarily leaving the area for work or travel, or any other change in employment status other than a transfer by current employer. Environmental and Mechanical circumstances such as fire, vandalism, labor disputes, weather conditions or mechanical failures. Travel plan cancellations - i.e. deciding to not travel to Revelstoke. All refund requests will be processed according to the schedule above. No exceptions. All refund requests are subject to the discretion of Revelstoke Mountain Resort. Guests must have a valid lift ticket or season pass on their person at all times. 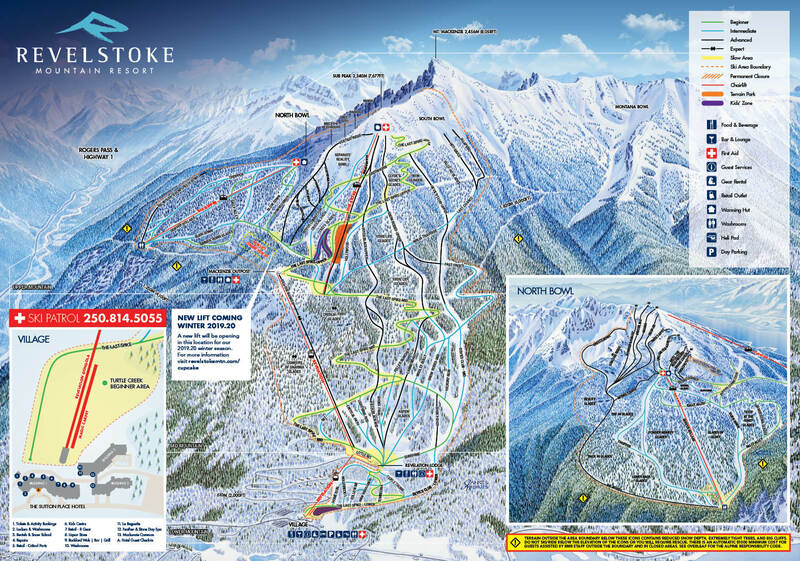 Guests may encounter ticket checking at any lift including the Stoke and Ripper chairlifts. All age cutoffs are based on the date of purchase. Those turning 65 after the date of purchase but before December 31, 2018 may purchase their pass at the Senior rate. Season Passes are not transferable and will be revoked for misuse, foul language, or violation of the Alpine Responsibility Code. Passholders caught transferring, selling and/or sharing their pass will be reported to the RCMP and will lose their skiing/snowboarding privileges for the remainder of the season. Passholders are responsible for any misuse while the pass is not in their possession. Any lost or stolen passes should be reported immediately to Guest Services. A $500 fine will apply if you attempt to on-sell your pass to another person or anyone other than the passholder is caught using your pass. Pass privileges may still be revoked even after the fine has been paid. All passholders must sign a Release of Liability Form prior to receiving their Season Pass. Passholders must show proof of age and address when picking up passes. Season Passes remain the property of Revelstoke Mountain Resort and are for recreational use only. Passholders caught skiing/snowboarding in a closed area will have their skiing/snowboarding privileges revoked for the season with no refund. Stay in Bounds! There will be an automatic minimum $1000 rescue cost for people assisted by RMR staff outside the Ski Area Boundary. A $25 administration fee will be charged to reprint any lost/forgotten season pass. The Season Pass Payment Plan is only available to guests who commit to purchase their 2018.19 Season Pass on or before April 30, 2018. All guests on the Payment Plan are required to provide a credit card and authorize that card for subsequent payments. Nine monthly payments subsequent to the initial downpayment are automatically drawn on the 15th of each month starting May 15, 2018 and ending January 15, 2019. Defaulting on payment dates in-season will result in suspension of your pass until the payment has been made. The Payment Plan is subject to the same conditions as a regular pass purchase, including Refund Option. Tots between the ages of infant to 5 years are eligible to be included in the family count. Proof of full-time enrollment (at least 3 courses) for both the fall and winter semesters must be presented at the time of pick-up. Showing your Student ID Card is not enough. A complete course listing from the Registrar's Office will be required. Our goal at Revelstoke Mountain Resort is to provide a quality skiing/riding experience for all of our guests. As a Season Passholder, you are required to abide by the code listed below. Passholders caught in violation of any of points below will have their skiing/riding privileges revoked and be responsible for any associated fines. Refrain from using any profane or abusive language in all public areas. Smoking in non-designated areas include but not limited to Gondolas, Chair Lifts, and mazes is not tolerated. Alcohol consumption is restricted to licensed areas at the Resort.